Winter: SKI IN AND SKI OUT on Peak 8! Summer: Epic Discovery in your backyard! The Timbers Lodge was created for the discriminating vacationer seeking the absolute BEST accommodations available. 3 stories of well planned space make up this impressive luxury vacation lodge. LOCATION, LOCATION, LOCATION... This is it! Just above the Base of Peak 8; next to One Ski Hill Place. A masterpiece created specifically for the discriminating vacationer requiring the best location, quality, style and amenities. You and your guests will love the ease of the ski in and out amenity in the winter... Easy access hiking/biking in the summer. You will surely enjoy the privacy of your own 6900 square foot, pine tree surrounded vacation paradise. Location: Ski in and ski out at the Peak 8 Base! 1.2 miles from downtown Breckenridge historic, shopping and restaurant district. The Timbers sits right on Trygve's Ski Run; just off the half-pipe at the Base of Peak 8! 100 yards to Peak 8 Ski School! The most perfect Breckenridge vacation; The Timbers has that and more! Comfortably Sleep up to 23 here! 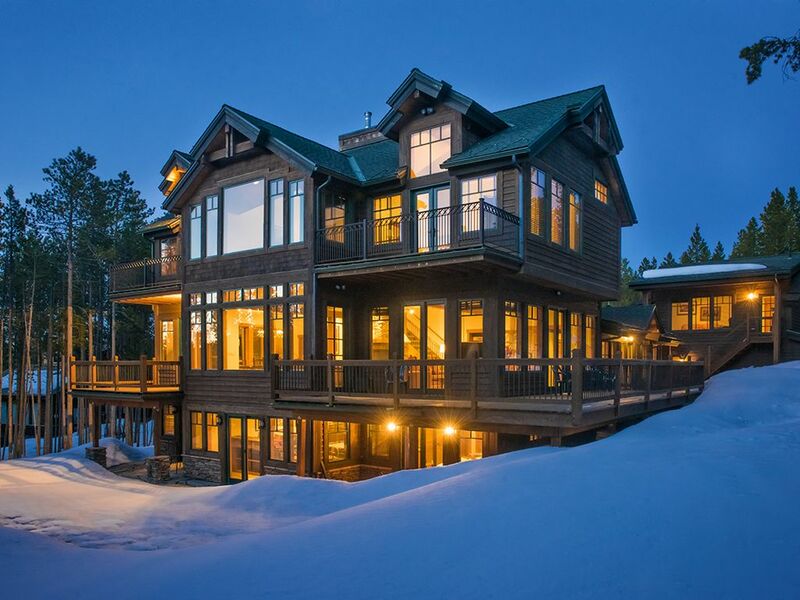 Owning and/or managing other Private Homes in Breckenridge; Please view our website; JanesLodges to find the perfect property for your Breckenridge Vacation! Born and raised in the Pittsburgh Area of Pennsylvania; I moved to Breckenridge, Colorado to start 'Jane's Lodges' with my Dad. Jane's Lodges has been operating for 28 years! My Dad and I purchased this home in 1997... It was a small structure with an incredible LOCATION. The idea was to create a large addition designed specifically to cater to the Guest looking for the perfect Mountain Vacation Residence. We added 5900 square feet to create what we call The Timbers Lodge. It has quickly become our most popular home as it caters well to larger parties......Friend and Family Reunions, Corporate Retreats, World-class Athletes have all been hosted here! Living in Breckenridge is magical..... If you spend just a week here; you will definitely experience a little piece of paradise in the Rocky Mountains! We try to create each lodge to exude all of the mountain comforts you would look for while vacationing in our town! Ski in and out Epic Discovery Location at the Base of Peak 8. Easy access to downtown Breckenridge via the Gondola. All the amenities you would look for in a vacation home. Great layout and space! Gorgeous, close views of The Ski Area. Master Window frames the Horseshoe Bowl. Ski in and out! Some movies at the property. We stayed at the house with two other families, each with three children. The house has a GREAT yard for kids to play in, the floorplan has good separation for large groups and Jane and her staff were very helpful will all our requests during our stay. Great ski-in/ski-out location. I highly recommend this house! Living the Ski Dream... for seven great days! Our family of 18 enjoyed this beautiful, comfortable and spacious home for one week in February 2019. Easy ski in/ski out at 4 o'clock run. The fully equipped kitchen brought out the chef in everyone! And the great room, with the great fireplace and stunning views was a favorite place for our family. Easy access to the hot tub, double washer/dryers and beautiful bedrooms and lots and lots of bathrooms. Very nice! Great for a group, especially with kids. It is 100 feet from the kids "magic carpet" lift. The 2 & 3 year olds in the group loved it! We have a large family this house had plenty of room. You can see the lift from the house.Tom and Jane were great driveway plowed every morning as we had 18" of snow during our stay. We would love to stay in this house again. Jody has a beautiful Family. Thank you so much for staying with us!!!! The Timbers Lodge was fabulous!!! There were 20 of us for our family reunion and we all had our own space if needed or we could hang together. We gathered to eat meals together of which there was plenty of room for all of us to sit at a table. We had several areas in the house to play games or watch tv! Some of us rocked on the deck, we sometimes sat and talked on the patio while some were in hot tub and some sat on the deck in the sun. My husband and I had coffee a couple mornings on our balcony. We also had plenty of room for another family to come and eat dinners with us a few nights. Jane and Tom were wonderful. They answered our questions and saw that any needs were met soon after brought to their attention. The house is a great location to town and also in good proximity to the gondola. We loved the warm floors in the king bedroom on upper level!! All the linens were very nice and the house was well equipped in the kitchen, laundry room, bedrooms and bathrooms. Everyone enjoyed the house and Breckenridge so much! letting us stay in your wonderful house and answering all our questions so expediently and thanks to Tom for always being available to address our needs. The house helped to make a memorable family reunion!! Great house for our large family reunion! We stayed at The Timbers for family reunion - 22 people ranging from 3 to 80 - and it was just perfect! It's a beautiful house with big windows all around. All of the accommodations were comfortable & there were plenty of bathrooms. Two huge dining tables let everyone eat together all at once. And the big green lawn was awesome for bocce ball/ladder golf/other lawn games. Plus everyone loved the hot tub of course! Jane & Tom were great & very responsive to our inquiries. And the pot of DELICIOUS thai curry waiting when we arrived was a wonderful welcome; it let us get in & settled to the house without having to take the time to prepare a meal for hungry arriving travelers. The proximity to the Peak 8 fun park was awesome for a kids fun day. And everyone got a kick out of taking the gondola to/from main street in Breck. Everyone in our group loved the place & ranked it as one of our best reunion accommodations ever! Highly recommended! The Minimum Age requirement to rent this property is 30. Guest renting, must also be staying at the property. WE DO NOT Rent this Property to College Groups; or College age groups. There is a 4-7 Night Minimum Stay Requirement on all of our Properties. Sometimes however, if a GAP is available; We will honor less than the Minimum Night’s Requirement. Please inquire. Maximum Occupancy: 23 (including children) A Refundable Security Deposit of $2300 will be added to your TOTAL Quote. The Damage/Security Deposit is fully Refundable. A Security Sheet will be included in your Confirmation Package from JanesLodges. Sorry, No Pets here. If traveling with your pet; Please check listing #1256 No Smoking; Strictly enforced. All Guests are Required to Review, Sign and Send back to JanesLodges AFTER RESERVING AND PRIOR TO CHECK-IN: Liability Waiver, Security Sheet, And when applicable a Credit Card Form. These items will be emailed to you from JanesLodges.